These public-trust rights passed to the people of the United States following the American Revolution. Each state constitution recognized the rights of every citizen to use the commons, but never in a manner to injure its use and enjoyment by others. The early conservation movement enacted laws to protect fish, wildlife, shorelines, lakes and rivers, and created our first national parks and secured vast tracts of land against exploitation and abuse. As late as 1913, the U.S. Supreme Court declared that it was “inconceivable that public-trust assets could slip into private hands.” Indeed the best measure of how a democracy succeeds is how it safeguards the shared assets as trustee for all citizens, rich and poor. Does it maintain the commons in the hands of the people or does it allow public trust assets to be privatized in the hands of the wealthy and powerful? During the Gilded Age of corporate feudalism, naked power brokering by industrial robber barons persuaded courts and legislatures to weaken public trust rights and allow the theft of clean air and water and public lands from the American people. As the Industrial Revolution gave way to the post-World War II industrial boom, Americans found themselves paying a high price for the resulting pollution. The wake-up call came in the late 1960s, when scientists declared Lake Erie dead, Cleveland’s Cuyahoga River caught fire and radioactive strontium 90 appeared in the breast milk of mothers across North America and in the most remote corners of the globe. On the first Earth Day in 1970, the accumulation of such insults drove 20 million Americans to the streets in the largest public demonstration in U.S. history. Motivated by that stunning display of grassroots power, Republicans and Democrats working together created the Environmental Protection Agency and passed 28 major laws over the next decade to protect our air, water, endangered species, wetlands, food and public lands. Those statutes included the Clean Air Act, the Clean Water Act and the Endangered Species Act, which were all designed to reassert the ancient public trust rights that had eroded since the industrial revolution. By making government and industry more transparent on the local level and giving the public a voice in allocation of the commons, those laws strengthened our democracy. Powerful corporate polluters would finally be held accountable for privatizing the commonwealth — those planning to use the commons would have to disclose the environmental impacts of their project and submit to public hearings; new laws gave citizens the power to prosecute environmental crimes. Even the most vulnerable Americans could participate in the decisions that determined the future of their communities. The passage of these statutes marked the return of these centuries-old rights of the commons to every American. The victory was short-lived, however. Earth Day 1970, and the popular citizen’s movement it helped spark, may have caught polluters and their indentured servants in our political system off guard, but over the next 30 years, they mounted an increasingly sophisticated and aggressive counterattack to undermine the new laws. Today, corporate polluters and their money have infiltrated every level of our political system. Lobbyists for polluters now run most of the regulatory agencies charged with protecting Americans from pollution. Among other things, White House policies have drastically diminished federal controls of mercury, which now contaminates most American fishes, weakened controls on storm water and sewage pollution, agricultural waste and mountaintop mining, and subverted wetlands protection. These rollbacks have encouraged the destruction and pollution of thousands of miles of rivers and streams, beaches and other waterways. Environmental injury threatens all of our national values. It undermines the rule of law, threatens our public health and national security, promotes corporate rather than local control and shatters the democratic concept of stewardship of our shared resources. It shows contempt for America’s historical ties to wilderness and the American traditions of responsibility, resourcefulness and commitment to community. That same pollution is both immoral and un-American. Our battle is a battle for the wellspring of our national values, for the idea of community, and for all the things that make us proud of our country. Law enforcement does not just punish law breakers or force polluters to stop polluting. It moves the milestones of public morality, stigmatizes lawbreakers as bad citizens, and helps restore the moral order. Partial Biography - Mr Kennedy is an American environmental attorney, author, activist, clean technology entrepreneur and radio host. He is an Irish American, son of the New York Senator and former Attorney General Robert Francis Kennedy and the nephew of former U.S. President John F. Kennedy. 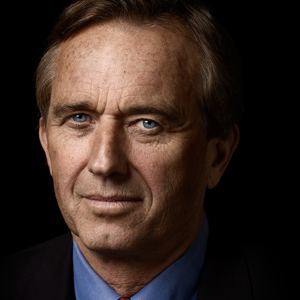 Kennedy serves as Senior Attorney and President of Waterkeeper Alliance ( https://waterkeeper.org ), a nonprofit focused on grassroots efforts to preserve and protect waterways worldwide. GreenMoney Journal is an award-winning monthly eJournal and website now in its 25th Anniversary Year. GreenMoney has focused on Sustainable Business and Impact Investing since its founding by managing editor Cliff Feigenbaum in 1992.